Coin Collecting Reviews – The Austrian Four Ducat Coin dated 1915. 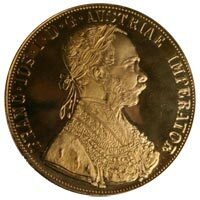 Austrian Four ducat coins dated 1915 are still being produced by the Austrian Mint and issued as official re-strikes. 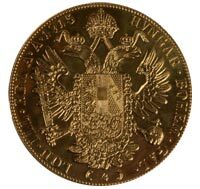 Ducats are produced in high purity gold, of 23 and three quarter carats, which places them among the highest purity gold coins ever issued for circulation. Ducats were first issued by Austria in 1612 with the last regular issue of ducats in 1914. All Austrian four ducat coins dated 1915 are re-strikes and there were 496,501 coins struck between 1920 and 1936. Austria has a tradition of issuing commemorative coins posthumously and after the death of Francis I in 1765, his widow Maria Theresa, decreed that coins would be issued bearing the portrait of Francis I and the date of his death. Alphabetical mintmarks were to be used to denote the actual year of issue, with A = 1766. Franz Joseph I was born in 1848, and died in 1916. He was the oldest son of Archduke Franz Karl (the younger son of Holy Roman Emperor Francis II), and his wife Princess Sophie of Bavaria. The young Archduke Franzl was brought up by his mother as an Emperor with an emphasis on devotion, responsibility and diligence. Franzl came to idolize his grandfather, der Gute Kaiser Franz, who died shortly before his fifth birthday. At the age of 13, young Archduke Franz started a career as a colonel in the Austrian army and from that point onward he normally wore the uniform of a junior officer. Franzl was named Emperor on 2 December 1848 and married Elisabeth ("Sisi"), Duchess in Bavaria and a girl of just sixteen on 24 April, 1854 in St. Augustine’s Church, Vienna. Sisi was stabbed to death by an Italian anarchist in 1898. Franz Joseph died in the Schonbrunn Palace in 1916 aged 86, during the first world war. He is said to have died singing "Gott erhalte, Gott besch?tze, Unsern Kaiser" ("God Save the Emperor"). He was succeeded by his grandnephew Karl. But two years later, after defeat in World War I, the Austro-Hungarian Monarchy dissolved. Franz Joseph’s 68-year reign is the third-longest in the recorded history of Europe (after those of Louis XIV of France and Johannes II, Prince of Liechtenstein).